Apple Cider Vinegar For Acne - Does It Really Work? Long heralded by natural living enthusiasts, apple cider vinegar can do a great many things – its inherent antimicrobial properties makes it an excellent household cleaner; it has several worthy uses in the garden; you can bathe in it to relieve painful joints and soothe a sunburn; drinking it will provide a full range of gut-friendly probiotics; use it on your hair and scalp to cleanse and clarify; and it can even help you lose weight. Clearly apple cider vinegar isn’t a one trick pony! Apple cider vinegar is the byproduct of the fermentation of apples, sugar, and wild yeasts. The cloudy, stringy part within the liquid is dubbed ‘the mother’ since this is what holds all the beneficial bacteria and enzymes. Pectin – While this ingredient is often used to make homemade jams, a 2011 in vitro study found that pectin sourced from apples may have an anti-aging effect by promoting epidermal growth. Vitamin B3 – Also known as niacin or niacinamide, vitamin B3 can help improve the appearance of large pores, uneven skin tone, and fine lines. Used topically, a 1995 study found that vitamin B3 was just as effective as clindamycin gel as an acne treatment. Vitamin B5 – Essential to all forms of life, vitamin B5 (pantothenic acid) may help improve the healing process of skin wounds. Vitamin B7 – Excellent for strengthening hair and nails, vitamin B7 – or biotin –has a place in skin health too. Though its role isn’t well understood, we do know that biotin deficiencies can lead to eczema and other types of skin inflammation. Vitamin C – Because vitamin C is a potent antioxidant, it can help curb the physical signs of aging. Additionally, it is essential to the biosynthesis of collagen, a major structural protein that helps restore skin elasticity, speed up wound healing, and keep skin cells smooth and strong. Magnesium – Though magnesium is involved in hundreds of functions in the human body, a study on magnesium-rich Dead Sea salt has shown that it improves skin barrier function, reduces inflammation in dry skin, and enhances skin hydration. Vinegars have long been used to kill microbes, bacteria, and viruses. Though apple cider vinegar is a much milder version than classic white distilled vinegar, it contains acetic, lactic, citric, and succinic acids – all of which have been shown to fight bacteria that causes acne. The main cleansing component of vinegar, acetic acid can help disinfect the skin. In a 2012 study, acetic acid mixed with essential oils improved acne conditions by a factor of 75%. Classified as an alpha-hydroxy acid (AHA), lactic acid is created in apple cider vinegar via the fermentation of sugars. Used topically, a 2002 study found that it produced a 90% to 100% reduction in inflammatory lesions, number of comedones, and cysts in 40% of patients, while the remainder experienced a 50% to 90% reduction. Found in fruits and vegetables, citric acid is another AHA that is widely used in the cosmetics industry. When combined with zinc oxide, a 2016 study found that citric acid had the capacity to kill off Propionibacterium acnes in as little as 24 hours after topical application. A powerful anti-inflammatory, succinic acid is a short-chain fatty acid that has been shown to inhibit the growth of P. acnes bacteria through both ingestion and topical application. Acne scars occur when a breakout penetrates so deeply into the skin that the tissues beneath it are damaged. In addition to affecting the texture and appearance of the skin, acne scars can cause patches of skin to become discolored in red, purple, or brown hues. While there are plenty of natural at-home therapies at your disposal to lessen the appearance of acne scars, severe cases are often treated with dermabrasion, chemical peels, or laser resurfacing to remove the top layers of skin. Use of organic acids to remove acne scars offers a gentler way to clear damaged skin and expose the healthier layers beneath. Lactic acid is considered a mild alpha hydroxy acid that can improve the appearance of acne scarring, as well as skin pigmentation. A small 2010 study evaluated the effects of pure lactic acid (at 92% strength) as a chemical peel for acne scarring and discoloration. The participants applied lactic acid every two weeks, at a maximum of four times. At the end of the three month period, 14% of patients experienced a significant improvement in skin lesions (over 75% clearance), 43% had good improvement (51% to 75% clearance), 28% had moderate improvement (26% to 50% clearance), and 14% had mild improvement (1% to 25% clearance). Although apple cider vinegar has yet to be the subject of clinical trials as an acne treatment, some brave souls have gone ahead and used it on their faces. 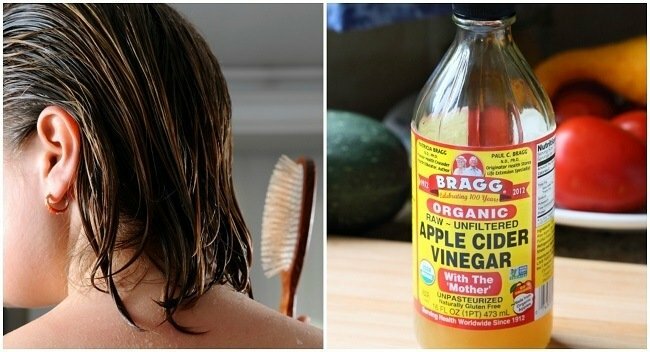 Of the 75 user reviews from people who applied Bragg’s Apple Cider Vinegar topically on Acne.org, 53 gave this product 4 or 5 stars. The most common experience was that using apple cider vinegar might make you break out after first using it (a phenomenon called skin purging where the organic acids in apple cider vinegar speed up cell turnover and cause short-term breakouts) but will eventually lead to clear skin with continued use. Because apple cider vinegar contains acids, applying undiluted apple cider vinegar to the skin may cause burns in some people. Never apply apple cider vinegar to open wounds. You may also wish to perform a skin patch test to see how your skin will react before applying it directly to your face. To do a patch test, simply apply a small amount to a sensitive area such as your inner wrist or behind your ear. If it burns, wash it away immediately. Otherwise, allow it to penetrate your skin for about 24 hours. If you have no reaction, you should be okay to use it on your face. If you do have an adverse reaction to apple cider vinegar, drinking it instead of applying it topically has had good anti-acne results for some users. Again, never drink undiluted apple cider vinegar. To find out more about how best to consume ACV internally, as well as some clever ways to actually make it taste nice, read this article. When applied directly on the skin or consumed in a drink, apple cider vinegar may help keep acne-causing bacteria in check and reduce the appearance of acne scars. However, what works for others may not work for you, so if you have especially sensitive skin, try using apple cider vinegar in small doses and watch how your skin reacts. Some people prefer to use it as a spot treatment, while others apply it to the entire face as a toner. Ready to give apple cider vinegar a try? We recommend using only raw, unpasteurized, organic apple cider vinegar ‘with the mother’ like this bottle by Bragg. Alternatively, you can make your own fermented apple cider vinegar – here’s how to do it.